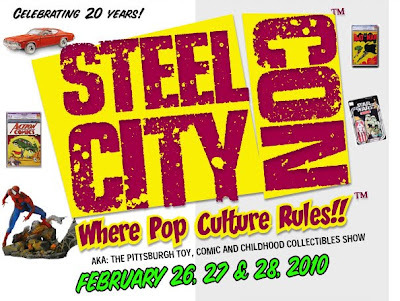 If you live near Pittsburgh or feel like taking a road trip, the first Steel City Con of 2010 will be at the end of this month. The show features vendors of toys and comics, artists, celebrities, and plenty of photo ops for the kids. Heck, there's even going to be a Delorean replica from Back to the Future! This convention also marks the first convention appearance of Zombies & Toys! I encourage anyone who can stop by to do so. If you can't make it, you can look forward to a full report shortly after. I will have a few surprise additions to the Zombie Toy Store available only at the convention as well! For full details on this upcoming event, check out the official Steel City Con site.